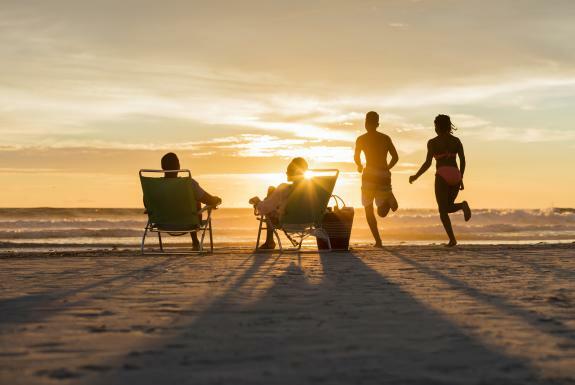 Daytona Beach is the happy host of thousands of families each and every summer, and it offers a list of fun activities that runs as deep and wide as our beaches. From visiting Daytona International Speedway to fishing off of the pier, there’s no end to the unique attractions and fun adventures waiting to be had here. 1. Putter around a natural playground. 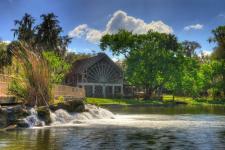 Just inland from Daytona Beach, De Leon Springs State Park provides a plethora of outdoor adventure. The park features 625 acres of exploration and natural wonder, all situated along the edge of a glorious waterfront. The park’s namesake spring produces 19 million gallons of water each day that consistently remains 72 degrees! You are invited to swim in the spring, and lifeguards are on duty during summer months. Or, rent a canoe, paddleboard or kayak right on-site and access the 22,000-acre Lake Woodruff Wildlife Refuge offering plenty of lakes, creeks and marshes to explore. Once you’ve worked up an appetite, visit the Old Spanish Sugar Mill Grill and Griddle House , located in a 100-year-old replica of the area’s original sugar mills. The restaurant features a “cook-it-yourself” approach to pancakes — a fun and unique way to enjoy breakfast. 2. Have your own night at the museum! At MOAS After Hours, you’ll enjoy exclusive stories, drink specials and a lively way to enjoy all that the Museum of Arts & Sciences (MOAS) has to offer with after-hour access to the museum’s galleries. The event provides live music, happy hour drink specials, and food for purchase from a local food truck! Plus, you can experience the museum in a new way via a special tour with the chief art curator, Ruth Grim, through the new Small World exhibition in the Ford Gallery. The exhibition looks at the significance of childhood and childhood experiences throughout the 18th and 19th centuries in Europe, and includes paintings, prints and objects from the collection. In fact, this Smithsonian-affiliated museum has many things to offer beyond its typical daylight-hours tours. For example, the Planetarium at MOAS offers daily shows (one show is included in the price of your admission ticket), as well as epic laser light shows each month. MOAS offers a world of discovery — and it’s all right within reach in Daytona Beach. 3. Rock out right near the beach. 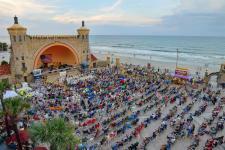 Head to Daytona Beach’s iconic amphitheater for a rockin’ summer night! At the Daytona Beach Bandshell Summer Concert Series, you can soak in the salty beach breeze and listen to talented tribute bands — at no cost! The shows on Friday and Saturday nights run through late September from 7­-9:45 p.m. General admission is free for all ages, but if you’d like to have a chair and VIP seating, you can opt to pay the nominal $10 fee. The bands’ musical offerings are multigenerational, ranging from a Rolling Stones tribute band to covers of Kid Rock — so guests of all ages are sure to have a blast at the Bandshell. Sound fun? Don’t wait! Plan your summer stay in Daytona Beach now. What else will you discover on your trip to Daytona Beach? Be sure to share where the day takes you while you’re here — tag us on Instagram @discoverdaytonabeach and on Facebook @daytonabeach. Enjoy a look at everything Daytona Beach has to offer and download our free official visitors guide or sign up for our e-newsletter.